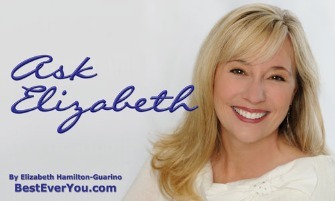 The Best Ever You Network - Ask Elizabeth - How Do You Load a Dishwasher? I'm curious if every marriage either starts off with this struggle or ends with it. I'm not sure. It's a messy battle if you are in it. The dishwasher wars might begin with something along the lines of this: One person doesn't feel like the dishwasher is loaded right and so they proceed to rearrange everything the other person has just done. I'm sure there are variations of this, for example, the sub-war of pans. Do pans go in or get hand-washed? China? Silver? Fancy wine glasses? Plastic? When the dishwasher should run? Who removes the stuff stuck at the bottom? Better yet, do you know a person who loves to soak everything and not load the dishwasher at all?! 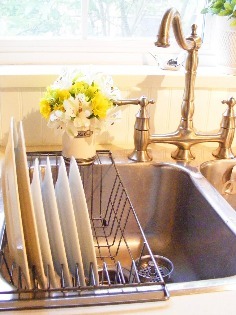 Do the dishes need to be rinsed first or can they just go from the table into the dishwasher? In my own home, I see lots of dishes left on the counter for mom or dad to put in the dishwasher, which we spoke to everyone about recently. We also see a complete avoidance to unload the dishwasher also. We even get asked questions like, "Where does this bowl go?" (You know the one they get out of the cupboard each day...!!) to add to the Xbox disruption. Open the dishwasher, leave it empty and just walk away?? Seriously, if you are just going to get rearranged, I say let the person go for it. Load and unload and rearrange to their heart's content - minus you. But wait, did the person do the pans? Sweep the floor? Wash the counters? Washed the cupboards? Appliances? Or did they just rearrange or re-load the dishwasher? Were they huffing and puffing and speaking under their breath the whole time? Angry even? Perplexed about how someone could possibly load the dishwasher in such a way? hmpff! There is so much that goes into really cleaning up the kitchen after meals. It's more than just the dishwasher and it's more than just loading, unloading or rearranging. If you've got chore wars going on in your house or control issues coming out in dishwasherland, it's time to turn the annoyance into an opportunity for a partner or family chat. Is someone helping? Controlling? Grateful? Is there gratitude or attitude at play? How should the kids help? When should the dishes be rearranged once loaded? Are there other chores where good energy could be focused? Where did smiles and laughter go? 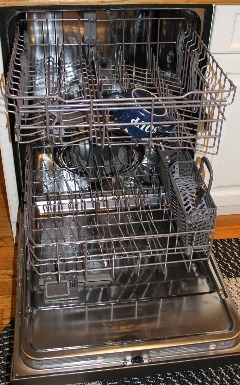 How does the dishwasher fit into the bigger picture of your life? What is really bothering the person doing the re-arranging? Think beyond the dishwasher. Do chores need to be rotated? What makes for a clean kitchen? Just where is the peace in all of this? Peacefulness went down the drain with all of this. Find it and bring it back. The peace may be the dishes you handwash, dry and put away. Put a little music on and someone washes and someone dries and puts away. 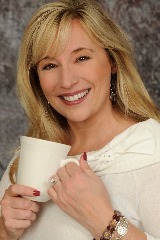 It could be that we need to stop, pause and be thankful we have someone to load the dishwasher with. Perhaps attitudes need rearranging, not dishes. I love this post, Elizabeth! It clearly illustrates how an apparently mundane issue/activity can turn into a huge opportunity for growth. Thank you!